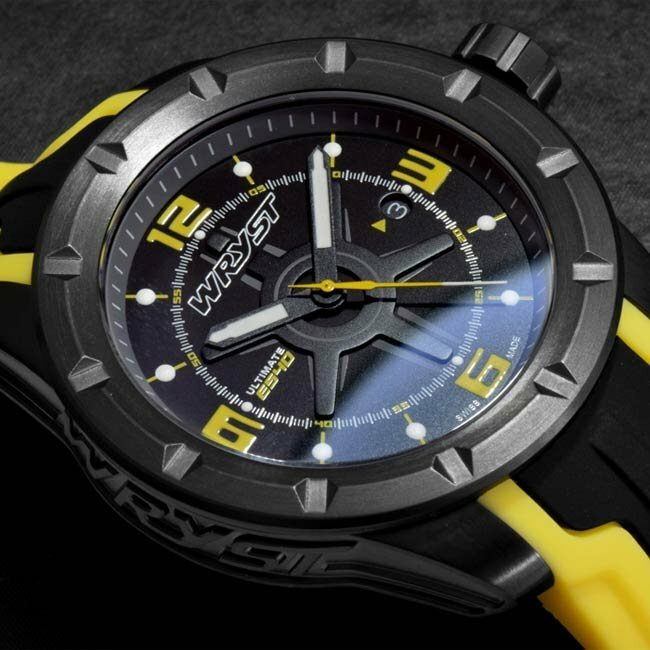 The black Swiss watch Wryst Ultimate ES40 with yellow details is dedicated to extreme sports. Offered in a limited edition of 99 pieces, this large 45 mm bold black Swiss watch with luminous hands and hour markers is ideal for outdoors & adventure. 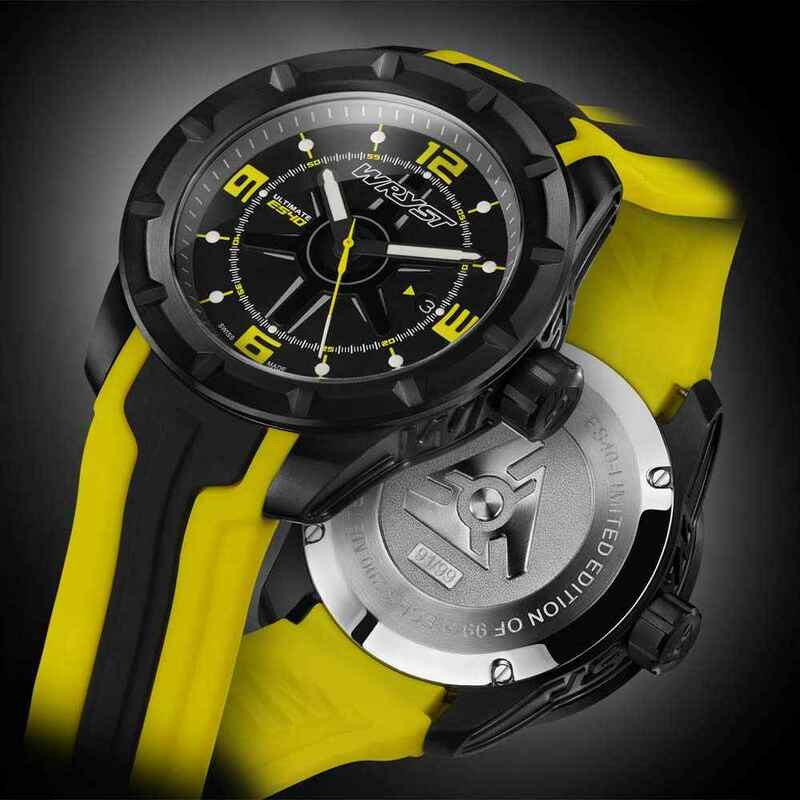 Engraved 0.6 mm deep on the case side, this exclusive black and yellow Swiss timepiece is designed for the bold. 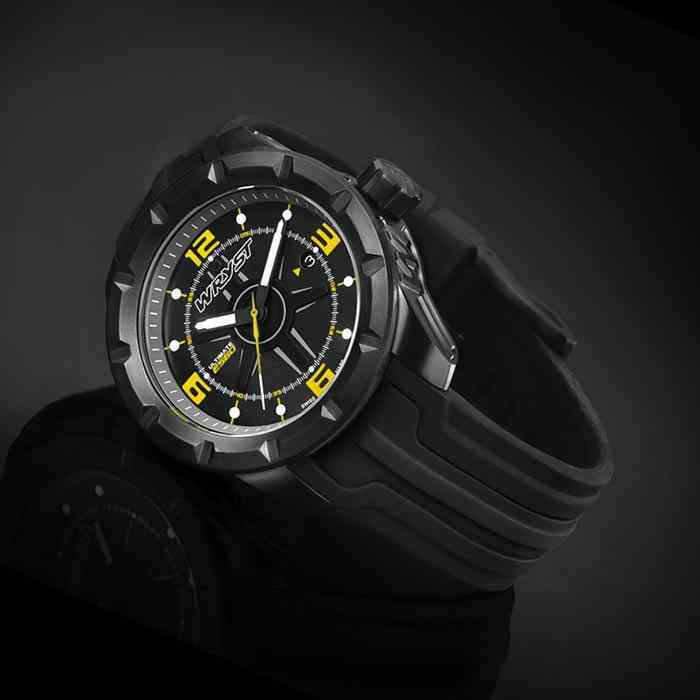 With a sturdy and technical casing, the scratch-resistant black DLC coating and sapphire crystal contribute to provide a black Swiss watch ready for casual wear as well as hostile environments. TWO BRACELETS ARE INCLUDED! The ES40 black Swiss watch features durable and most importantly a black DLC scratch-resistant coating. 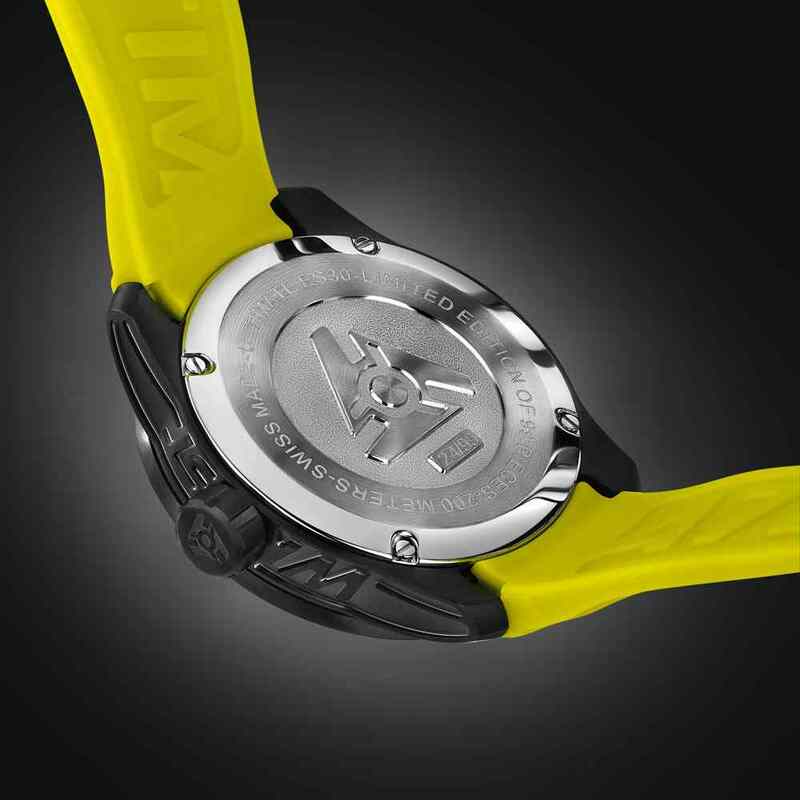 The DLC technology on the case, crown and buckle is a must have for outdoors and intense use. 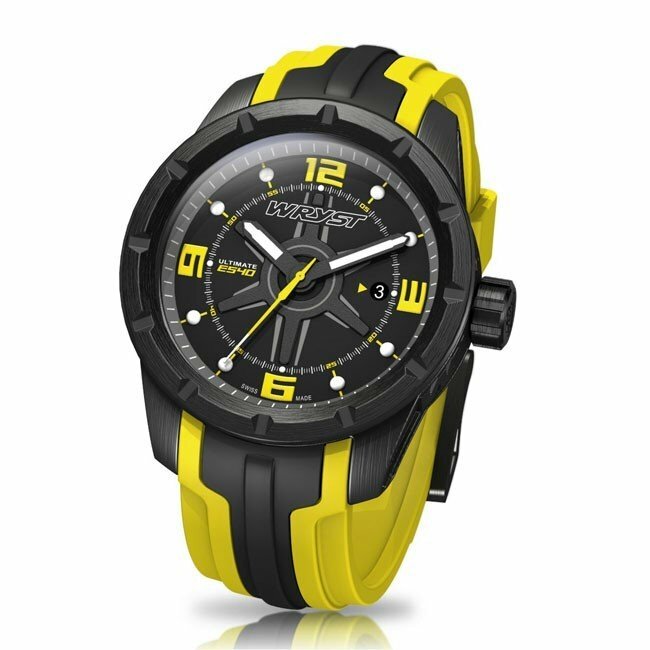 The bright yellow details and luminous hands give this sports watch a comfortable sensation and clear time reading. There is also a date window at 3h position. 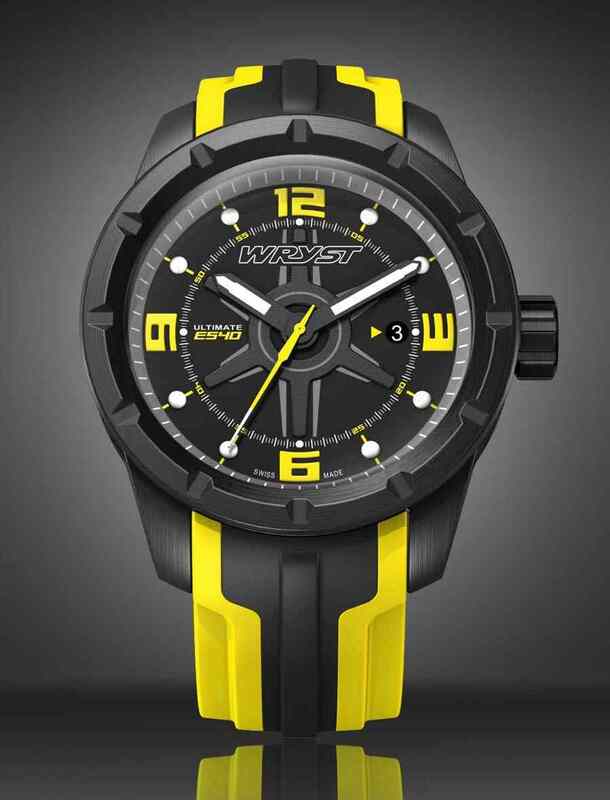 Two bracelets are included with each Wryst Ultimate black Swiss watch. The world-renowned quality of Swiss watches is undeniable. This Ronda 515 gold-plated quartz is a great asset. Resistant to shocks, magnetic fields and also fluctuations in atmospheric pressure, gravity will never prevent you from keeping a timing to the nearest second. The sapphire crystal 2 mm thick is intelligently below the level of the bezel. This is to further accentuate the longevity of the timepiece and avoid any direct contact of the glass on flat surfaces. The crystal is coated with an anti-glare protection for a better reading of the net time in all the lighting. Laboratory tests at 20 atmospheric pressures qualify for a water resistance of 200 meters. This is largely enough for most water sports and recreational activities in the water. Moreover the bottom of the case is maintained by four consequent screws, and the crown of this black sport watch has a screw-down crown. 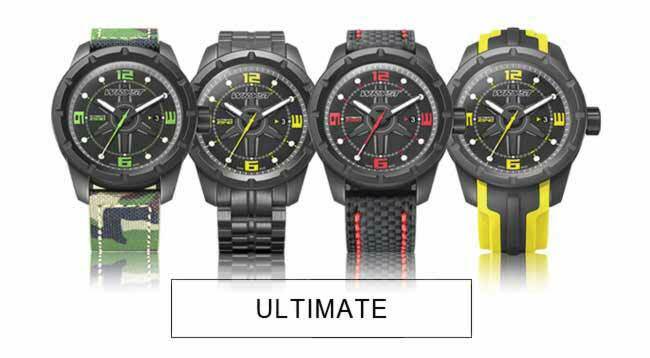 In order to offer a look that is both unique and versatile, the models in the Ultimate collection are all offered with two different bracelets. 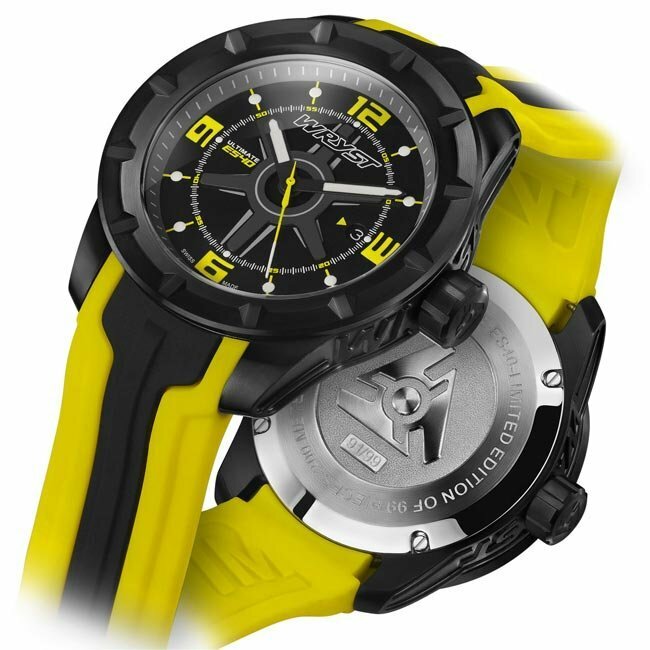 A double injection yellow silicone bracelet with a large black central line, and a second black-on-black. In the end, you can fully appreciate the performance of this watch three hands / date. 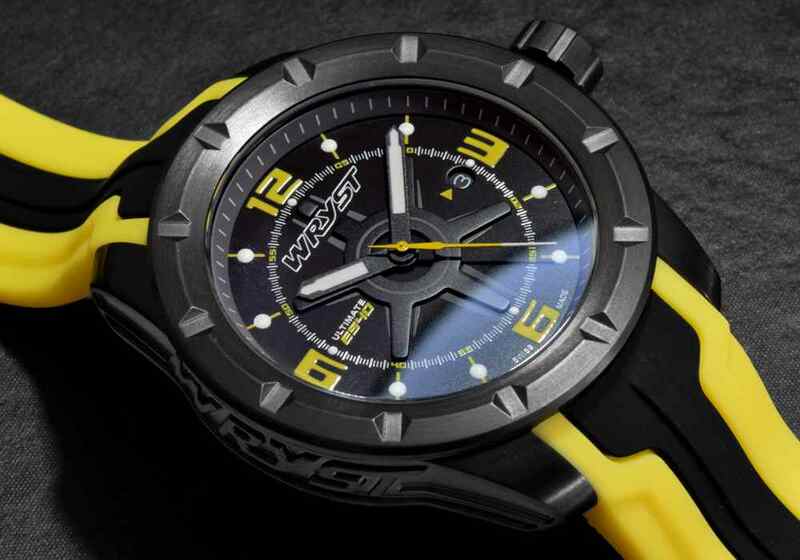 This Wryst ES40 black sport watch can become your best companion for many years to come. After all, what else do you expect from a Swiss Steel Grade 516L Black Weather Guard.